Patent no. 585232. Person registering the patent: Johann Schweiger. Date: 1912. Place: Berlin Patent office. Name: Schweiger system. The key that will not let you in unless you lock the door first. The eternal promise that is becoming coercion. The idea was simple yet effective. In order to increase safety in the multi-tenant houses with several courtyards and no concierge, the main entrance door needed to be locked at night. Berlin front doors at the time had simple handles (the kind that even cats can open by jumping on it, very very heavy cats, that is) instead of modern-day door knobs. 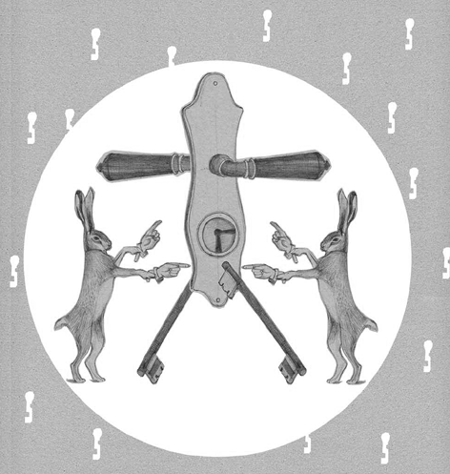 The key to the key was a mechanism that would not allow the user to withdraw the key from the keyhole unless it was turned back into the locked position from the other side of the door. The key itself had an identical tip on each end but no loop to dangle it from. The key hole had two channels positioned at 45 degrees to each other. 1. The house's caretaker locks the door when darkness sets in. From this moment on, every person passing through the door will keep this status quo intact. 2. To unlock the door, insert the key into the lock, turn it one and a half times and then push it right through to the other side. Enter your house and shut the door behind you. 3. Use the protruding end of the key to re-lock the door and pull the key out towards you from the vertical hole. Go to your flat. The key is now part of the collection of the Museum of Objects. Katja Bechmann is an author, interpreter and translator.